Produced with its own technology that helps to produce cost effective mineral block with heavy resistance in different weather conditions. Helps to solve the mineral deficiency of ruminants, wild animals, zoo animals by licking the block whenever it requires. Has to be hanged using a rope in the hole found at the middle of the block and should be kept hanging at a height where the animal can comfortably lick the block. Like a doctor 24/7 inside a farm. Solves mineral deficiency,at early stage which can lead to major problems in reproduction if observed later. Helps in better reproduction, maintains the health and improves the milk production. 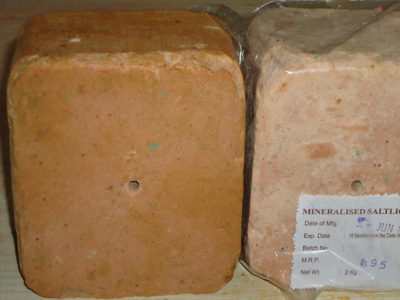 Produces mineral mixture with trace minerals and also with vitamins. Helps to improve milk production when added @ 25 grams every day while feeding the animal with feed or bran. It is packed in 1kg mostly. We produce FERTITONE which very effectively solves the fertility problems in livestock.